Mitchell Yass, DPT, is creator of The Yass Method, which uniquely diagnoses and treats the cause of chronic pain by looking at the source of pain and following its trail from where it hurts to where it starts. It’s all angles and connections. Dr. Yass’s research and patient experience has found that the conventional method of diagnosing through X-ray and MRI is “baseless and useless.” Over his 20 + years of practice, he has resolved the pain of thousands who had surgery that didn’t fix their pain and stopped thousands of others from getting unnecessary surgeries or using unnecessary and dangerous medications. 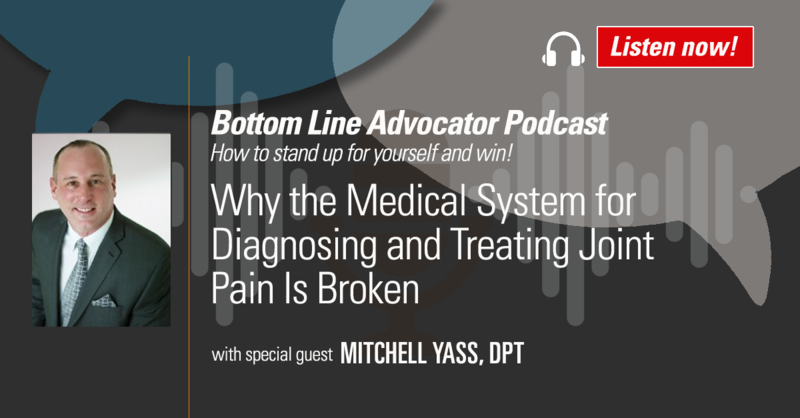 In this episode of the Bottom Line Advocator Podcast, Dr. Yass joins Bottom Line President Sarah Hiner to discuss the wasted time and money the medical system uses to diagnose and treat pain and how you can resolve your own pain with the Yass Method of identifying the source of the pain and strengthening that area with simple targeted exercises. They also discuss the “cultural acceptance of chronic pain,” which Dr. Yass believes is a global epidemic that needs to be addressed. In addition, they walk through some of the mistreatments and misconceptions regarding knee pain, back surgeries and hip problems—and outline the proper and safe way to locate, diagnose and treat them.